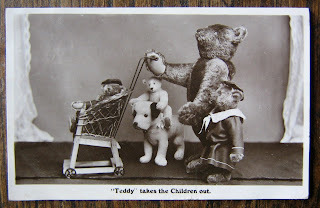 The most sort after Teddy Bear postcards feature photographic images of real teddy bears; if you can identify who made the bear in the photograph, this makes them more valuable. 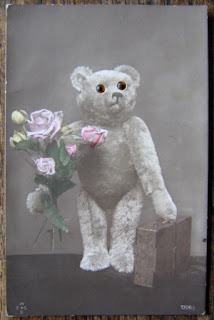 The most valuable are the ones that feature Steiff Teddy Bears. The top three postcard do this. Generally they have to be in good condition and ideally with a stamp and dated frank on the reverse, most collectors do not mind slight wear to the corners. 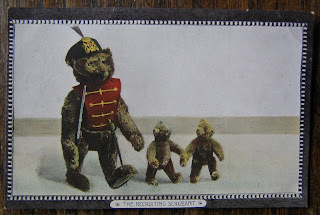 The last two postcard feature Farnell Teddy Bears, the top one actually has amber glass eyes, the bottom one features the Queen Mother holding a wonderful white Farnell, I would love to know where that bear is now. 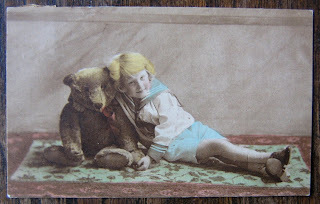 Other types of photographs in a postcard format are actually original photographs of a child holding their bear, these can also be highly sort after. If you have run out of room with your real bears, this is a great thing to continue collecting. It is also fairly affordable, with some being as little as £3 or £5 each; but the best items can reach nearer £50 to £60. Have a look at my website if you are interested in buying postcards, or visit me at my stand at Hugglets, I have an album full of them for you to look through. Not only are these a great collectible for people lacking storage space, they're also beautifully nostalgic images of bear history. 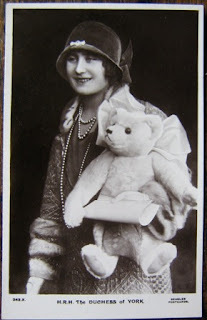 I wonder whatever happened to the Duchess of York's aka The Queen Mother's bear? Could it be living at Buckingham Palace?